Parrot Tricks: Why Train My Parrot, and Where do I Start? Home | Bird Training | Parrot Tricks: Why Train My Parrot, and Where do I Start? People have mixed feelings about teaching budgerigars, macaws, cockatoos and other parrots to perform tricks. Some claim that such is somehow “degrading” (to the bird, I assume!) while others consider training to be vital in forging a good relationship with one’s pet. My experience with captive animals of all types has convinced me that, when properly carried out, trick training greatly improves the quality of life for parrots and other highly intelligent creatures. In zoos, marine mammals and elephants are trained as a matter of course, in order to simplify veterinary examinations (i.e. when an elephant raises its foot to allow the pads to be seen) and to keep the animals occupied with stimulating activities. Much the same is true for pet parrots. The training process itself also helps to forge a bond between the parrot and its owner. As a first trick, I highly recommend teaching your parrot to “shake hands”. This behavior is merely an extension of one that many well-adjusted birds already perform – that of stepping up on your finger or arm. If your bird has not yet mastered this, then please do not attempt to teach it any tricks at this point…such will only frustrate both yourself and the bird. Please write in if you need further information. To train your parrot to shake, you’ll need a cage-top or similar stand set up in a quiet, distraction free room. Training should involve no punitive actions whatsoever…your parrot will be quick to make the association and will lose interest. Improper responses should be ignored, favorable actions rewarded with a small treat. The treat used should be hidden from the bird’s view until needed, and should not be part of your pet’s normal diet. Training sessions should last for at least 10 minutes, and, ideally, should be terminated before your parrot becomes bored and loses interest. As you come to know and understand your parrot’s personality, you will become adept at judging when to end a training session. Although some parrots exhibit amazing abilities to retain what they have learned, for most the road is bumpy at best. Progress is rarely made on a predictable basis…be prepared for a “1 step forward, 2 (or 3-4!) steps backward” type experience. Your patience is key… do not attempt a training session when you are ill or under time pressure. Much like infants, parrots are very much attuned to subtle cues, and will pick up on and respond to your mood. To teach a parrot to shake hands, first touch its foot while saying “shake hands”. As soon as the foot is lifted, praise the bird and provide a small treat. Once the bird consistently raises its foot on cue, begin to gently grasp the foot and shake it. At this stage, provide praise and a reward only after the bird allows you to shake, not when it lifts the foot. Practice in various locations, gradually increasing the types and degrees of distractions to which the parrot is exposed when given the “shake hands” command. 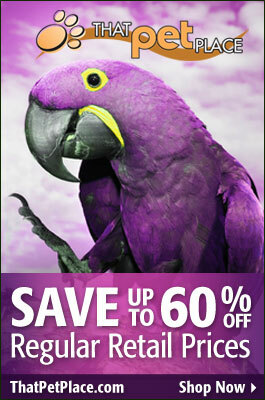 Please also check out our extensive line of parrot care books http://www.thatpetplace.com/pet/cat/infoL3/22315/category.web. Parrot training is a quite complex undertaking, and the specifics vary from bird to bird. Please provide a bit of background on your bird and its environment and I’ll be happy to provide some ideas.